Can I Accumulate Vertically To Create a Buffer/Accumulator For My Pallet Handling Conveyor System? In the engineering world, you normally think you move things horizontally on a flat plane and you lift devices using an elevator (a vertical transport unit, or VTU). Typically, you wouldn’t think to use conveyors to move anything vertically, other than maybe returning empty pallets to the front of the line, or in similar use cases. Applying conveyors to move things vertically is a new way of thinking. These are some examples of different VTUs and recent ways our integrator clients have creatively implemented our conveyor applications to create a buffer for their pallet handling conveyor systems. A dual deck VTU is two conveyor decks, contained within a single VTU footprint, which can go up/down simultaneously. You are even able to drive each deck individually (our dual- or multi-axis VTU lines make this possible).The possibilities for this application as an actuator are endless. Dual deck VTUs are used by many of our integrators’ clients for inspection and quality control. While a specific pallet, tray, or product to be inspected is elevated to head level using the first lift, good product can continue to move through underneath. This actuation off the main line prevents the inspection phase from slowing down production. 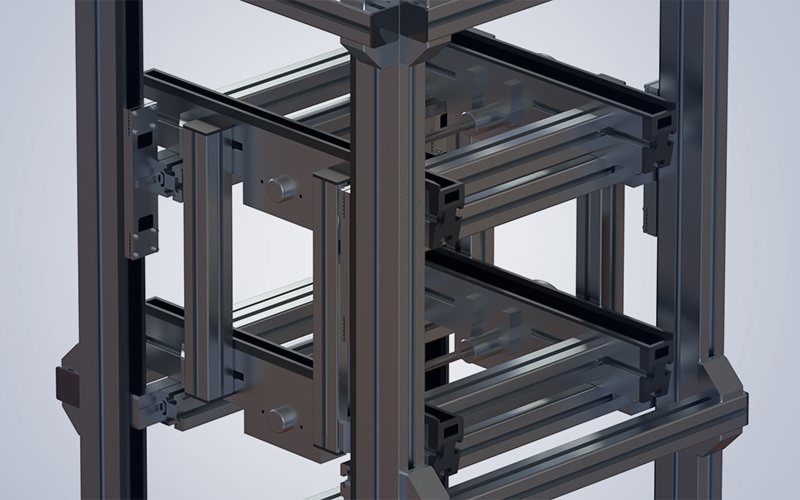 A servo-driven conveyor can be programmed to stop at multiple positions, customizable to the millimeter, within a lift stroke. This innovative use of stepper- or servo-driven motors allows for multiple stops along a conveyor and in an elevator, instead of just two stops, which is traditional. 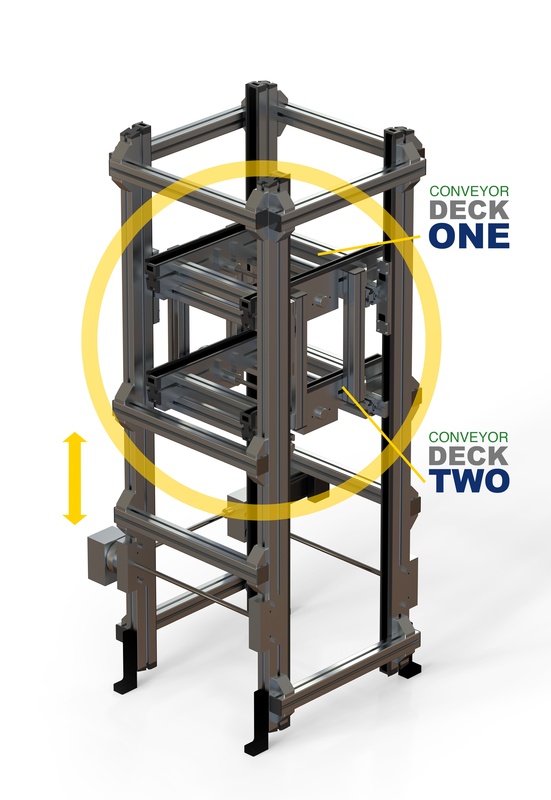 Most other elevators are pneumatic-driven using a cylinder; it’s difficult (if not impossible) to have more than two accurate pallet stop positions. With a stepper or servo-driven system, the motor has a built-in position encoder, so it knows how to accurately stop at an exact spot and can stop within an elevator as many times as needed, in any increment needed. This is especially good for delicate products or products requiring precision movement, such as for moving liquids. With a stepper or servo-driven conveyor programmed for multiple positions, you’re also able to start slowly and ramp up the speed, then slow down slowly without launching the product (thanks, Newton’s First Law of Motion). One customer embraced the “build up rather than out” philosophy and we helped them create multi-level storage systems for product totes. They’re using an inventive version of the Glide-Line 360 to load and unload products into a large, multi-level cell-beam system using multiple positions in servo-driven conveyors able to stop at any location. Accumulating vertically by creating a buffer above the main line of your clients’ pallet handling conveyor system is just one of the innovative ways we’ve used pallet VTUs. Read more in our ebook Innovative Ways to Create Customized Lifts and Vertical Conveyors.